I Mustache You a Question?? 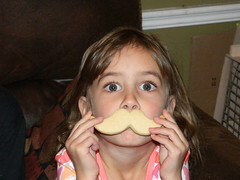 Making Cookies Fun! I LOVE cookies and cookie cutters, recently I actually sold a HUGE box of cookie cutters I didn't feel I used much any more in order to make space for some new fun items and to clean up my kitchen a bit. 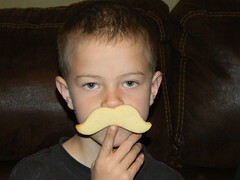 A few days after I received this fun review opportunity from fuzzy-ink.com to review a cool set of cookie cutters. 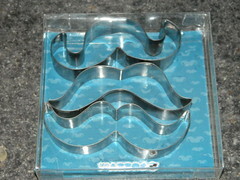 Yep MUSTACHE COOKIE CUTTERS! We made sure to pick our favorite sugar cookies and rolled out the fun. Made of metal the cookie cutters are super easy to use and I didn't get the sticking issue I sometimes come across with some of my plastic cutters. I loved that there was three separate styles of mustaches so everyone could have a style of their own. If you are looking for a fun way to spice up your party or event head over to fuzzy-ink.com for this great cookie cutter set. The cutters measure around 4"W x 1.25-1.5"T but vary depending on shape and are made of 100% stainless steel. 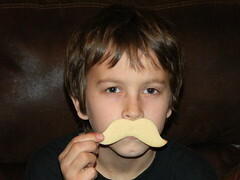 $5 from the sales of each set go to the Movember Foundation. You can help change the face of men's health. Make sure you enter the great giveaway below!